As a bundled accounting solutions company, Essential Business Services can prepare your company’s tax returns and provide experienced assistance with tax planning. EBS prepares tax returns for businesses and individuals. We also provide strategic tax planning and tax representation services. We stay current with tax law changes and inform and educate our clients in ways to minimize tax liability and maximize profit. EBS serves businesses from all industries. Our services include tax planning, tax return preparation and tax representation. We understand that tax strategy must be developed and carried out in cooperation with business strategy. Because we provide day-to-day accounting, payroll and tax planning support for our clients, preparing tax returns is simply the final step in closing the books for the year. This workflow means that our clients save both time and money when using our tax preparation services. We provide efficient services to not only save our clients time and money, but we also lower the time and cost of sending data to us. We understand that our clients are busy and have more important things to do than to search for and deliver files to our office. We collaborate with our clients efficiently using an online client center where data and communications are easily exchanged. As an EBS client, you have access to your own online project center where you can leave us messages, share files (even large files that are difficult to transport via e-mail), and ask and answer questions as we work on your accounting and tax projects. We also post important updates and action items to keep your projects moving along. Tax problems, like unfiled returns, unpaid taxes and filing mistakes that trigger expensive audits, affect many Americans and if not dealt with quickly, the debt, accompanying penalties and overwhelming stress can sink businesses and leave families financially devastated. The strategy should always be to resolve the tax issue promptly while protecting your interests fully. 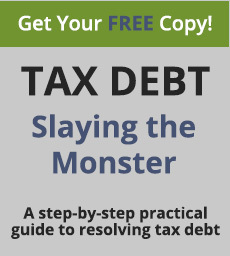 This simple strategy can seem impossible to implement for taxpayers dealing with the Internal Revenue Service (IRS) and/or state tax agencies. Essential Business Services (EBS) is a full service tax debt resolution company. We represent individuals, corporations, limited liability companies, partnerships and sole proprietors before the IRS and state in tax collection and audit matters. If you or your company has received a notification from the IRS and/or state for collection of back taxes, assessed penalties, wage garnishments, Trust Fund penalties and debt, or notification of a compliance/full audit or unfiled tax returns, EBS will evaluate, research and help you understand the tax agency position. We will assist you in preparing a response and also negotiate a settlement on your behalf. Licensed by the US Treasury (IRS) and a NTPI Fellow®, Denise Robinett has in-depth training in how the IRS reviews returns. At EBS, we minimize audit risk by analyzing returns for potential red flags before filing. Our dedication to providing the most current, effective tax services does not end on April 15th. Throughout the year, we stay abreast of tax law changes and new strategies for helping our clients minimize their tax liabilities, remain compliant with tax law, and reach their financial goals. Denise Robinett, is also an Enrolled Agent, a tax professional authorized to represent taxpayers before the Internal Revenue Service. Enrolled Agents are the only tax professionals allowed to practice in any state. See our About Us page for more information and a video on why Enrolled Agents, an exclusive group, are America’s Tax Experts. Call us at (703) 754-2601 or contact us for a free consultation.